The best advice anyone can give you when choosing pillows and cushions is to look at the space. Get a sense of what the furniture and space need for the time you will spend there. Is there a pool? Will it be for a relaxing afternoon read? How many guests will you entertain? At night or during the day? These are just a few of the questions you should answer before making any decisions. Once you have a plan you can even get custom foam cushions for the sizes you want. Select a theme that you will love seeing every day for years. Avoid going for themes that are in fashion and look at the long game. Always stick to a theme that matches the furniture and surroundings. Software exists that allow you to visualize a space, along with furniture and color before you buy. First, get the right furniture for space and intentions, and then get the cushions and covers. The Foam Factory specializes in manufacturing various foam products ideal for the indoors and outdoors. 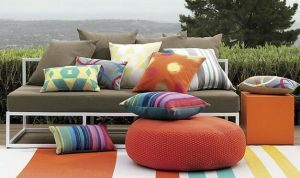 They provide a unique fast-drying foam that is ideal for outdoor seat cushions.